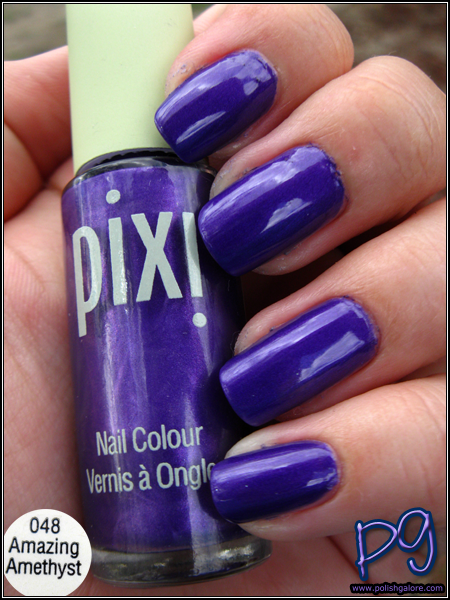 On a gloomy day, I decided to pull out Pixi Amazing Amethyst from their fall 2012 line. I used a base of Cult Nails Get It On, 2 coats of polish and finished with Cult Nails Wicked Fast. The polish behaved well - no flooding of cuticles, good opacity and did not stain my fingers. Due to no sun being out to play, you have an overcast picture. This color reminds me of China Glaze Grape Pop but is more blurple I think than GP. I will have to pull swatch sticks to do a comparison in the future. I'm in the middle of a huge purge/brand reorganization in my house that I'm hoping will be completed by 2014. Indirect light doesn't fair much better for showing how pretty this color really is. I'm calling it a metallic because it has a bit of a sheen and isn't a creme but isn't a shimmer either. It's pretty though. And flash for good measure! The polish almost looks waxy or rubberized here but it's just the way the light is hitting the bottle. I still haven't gotten used to this long skinny bottle - be careful not to tip it over or you'll get a puddle of polish on your desk. Thankfully I haven't done that... yet. Pixi [Website | Facebook | Twitter | Blog | YouTube] can be purchased online from their website or use find a retailer using their Online Retailers search engine for $8.00 for a 7ml/0.25 fl oz bottle. You can also purchase Pixi at Target! Wow that is such a gorgeous shade! I've never tried any of the Pixi polishes! They are pretty neat! You can find them at Target stores if you have one near you! Interesting! I've never seen a review/swatch of the pixi polishes so thank you for that! Do you own any others? I do! I have 6 total - if you click on the "Pixi" label, that's where all the information on them will be (I've only reviewed 2 so far, haha - I'll get to them, I promise! ).